A spicy Japanese take on Panzanella with fresh wasabi root and earl grey infused potatoes, cherry tomatoes and fresh corn. Sometimes inspiration hits you on the head like a coconut falling from a tree. Other times, it’s more subtle, like a thicket of nettles hiding in the underbrush, or a scarlet box of strawberries at the farmers market. Then there are the times that the route is so circuitous, anything short of a full explanation would leave most scratching their heads wondering what illicit substances I’ve been smoking. Take this dish for example. It started out with a bunch of macarons and a knub of fresh wasabi. Claire from Colloquial Cooking and Stéphane from Zen Can Cook came over this past weekend and made some Wasabi and Grapefruit Macarons from Pierre Hermé’s tome on macarons. I’d always associated wasabi with sushi and sashimi and it had never really occurred to me to use it in any other context, let alone in a dessert with grapefruit! I was skeptical to say the least, but true to his reputation, the macarons were incredible. They were so good, I nearly pranced down the halls of my building singing their praises like a giddy schoolgirl. Best of all, Claire and Stéphane left me the other half of the wasabi making me promise them I’d make something tasty with it. Naturally, the first thing I started thinking about was how I could apply monsieur Hermé’s concepts without outright plagiarizing his dessert. So I kept taking bites of wasabi and throwing out ideas. A train of thought that went something like this. Sinuses cleared, I had the seeds of some ideas that grew into bigger ideas like earl grey and wasabi ice cream, wasabi gazpacho, and corn and wasabi souffle. Then the other day, I was gifted a loaf of spent wheat bread which was enjoyed with honey and cheese for several days before it started going stale. Suddenly things started to coalesce. The bread could be turned into panzanella with a wasabi dressing, to which I could add some raw fresh corn and tomatoes. For color and a vibrant earthiness, I could mince up some mitsuba which has a nice cedar-like fragrance. I also happened to pick up some gorgeous halibut fillets on sale at Wholefoods which I figured would go great with the panzanella and bring the wasabi full circle back to the realm of seafood. I still didn’t have the bergamot flavour in there though and I tried to think about how I could work that in. Could I marinate the fish in tea? Maybe I could I toss in some spent tea leaves, Burmese style? That’s around when it occurred to me that potatoes would make the perfect vessel for carrying the bergamot flavour. While they were cooking, the earthiness of the potatoes mixed with the citrusy earl grey and filled the apartment with a wonderful aroma that made me want to grab a fork and eat them straight out of the pot with butter. By letting them steep in the tea overnight, they take on a striking auburn color that makes them as pleasing to look at as they are to eat. You’ll only need one potato for this recipe, so you could turn the rest into a potato salad, or reheat them and have them with some butter, you could even cut them up and fry them in a bit of duck fat. So how was the dish as whole? Everything from the fish that was crisp on the outside and moist and and tender on the inside to the nuanced panzanella to the earl grey potatoes it contained worked together better than expected. It was one of those things where each flavour and texture harmonized to make the whole better than the sum of its parts. The best part was that aside from the potatoes, the rest of it took almost no time at all to prepare. A day before you plan to make this, put the whole potatoes in a pot just big enough to hold all 4 and cover with water. Liberally salt the water then add about 2 tablespoons of earl grey tea. Bring to a boil and check the color of the water, it should be a dark brown color, if it isn't add more tea. Turn the heat down to maintain a gentle simmer then cook until you can just pass a fork into the center of a potato. Turn off the heat and let the potatoes cool in the liquid, then refrigerate overnight. To start the panzanella, toss the bread cubes in 1 tablespoon of olive oil and some black pepper. Spread on a baking sheet in one layer and put into a 300 degree oven until the cubes are golden brown and crisp. Remove from the oven and allow to cool. In a medium bowl, add the chopped earl grey potato, tomato, corn, and mitsuba. For the dressing, whisk all the ingredients together. The wasabi starts loosing its potency as soon as it's grated, so make sure you submerge it in the oil and yuzu juice quickly. For the halibut, start heating a cast iron skillet over medium heat while you prep the fish so it gets very very hot. Rub all sides of the fillets with paper towels to remove as much moisture as possible. It's important that you get it as dry as possible to get it to crisp on the outside. When the pan is hot add a 2 tablespoons of a high smoke point oil to the pan then sprinkle just the skin side of the halibut with salt and white pepper. Put the fillets skin-side down into the pan and fry undisturbed until it is opaque half way up the fillets and they easily come off the pan. Use paper towels to carefully dry the non-skin surface of the halibut (be careful, the oil will sputter), then salt and pepper this side. Flip the halibut and continue to fry until it's golden brown on the flesh side and cooked through (about half as much time as you cooked it on the skin side). Transfer the fillets to a plate while you finish the panzanella. To finish the panzanella, add the bread cubes and dressing to the bowl of vegetables and toss to coat everything with the dressing. 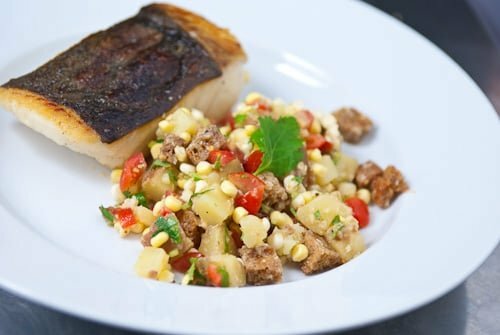 Put down a layer of panzanella onto a plate then top with a halibut fillet. Am intrigued by the earl grey potatoes naturally. I will have to give them a whirl sometime! so lovely and creative. love the earthy flavor of the bergamot! I’m secretely praying that whatever we cook tomorrow will make you feel like a giddy schoolgirl again so that I can take pictures and blog about it. I feel my blog’s trafic is about to skyrocket. Swell. dude… all i can say is this… “dyammmnnn! that looks good!” I wanted to make a fish dish for my girl (never done before), so this is a great and appropriate post for me. thanx buddy! I love riding on the train of your thoughts. . .Earl Grey potatoes, quite brill! you are so inspired! dang, those are some caffeinated spuds. I only had grated wasabi once, whith sushi at the ritz. In Sf, there is a plce where the owner gives the regulars grated wasabi, but the drifters powdered. I gotta get my name on that list. WHOA. that panzanelle made my heart skip a beat. SERIOUSLY. it sounds so good. panzanelle is one of my favorite summer meals! Love the idea of earl grey potatoes but I always find that earl grey has this bitter aftertaste. The earl grey potatoes sound really interesting. and panzanella is always delicious. Wow, Marc! Lovely:) I do love the way your brain works. The first dessert I ever “crafted” for the restaurant was a dessert panzanella–I made lemon poppy seed pound cake, cubed and toasted, tossed with fresh stone fruit. The “dressing” was a minted lemon verbena simple syrup and to top it off, sweet milk basil sorbet played the part of the mozz. I am thinking now that a bit of heat might have just put it right over the edge. You make me have Thoughts, and that’s a Very Good Thing! Great instruction on getting the skin nice and crispy! Wow, Marc, what a fantastic meal! I never would have thought about Earl Grey tea, that’s my all time favorite! I have a wasabi oil I got from Trader Joe’s and man is it spicy! It will clear your sinuses!! The panzanella sounds like it would knock our socks off. Thanks for stopping by my blog. You’ve got a great one here! Earl grey and potatoes are two of my favorites. Thanks for marrying them in this splendid recipe. YOU are an inspiration! this is definitely creative – you’re too much, eating wasabi to get inspiration! like they say, “beauty is pain”, i guess “creative cuisine is pain”. i do think the earl grey potatoes would be interesting to try. and the crispiness of that skin on the halibut… very nice.